I'm a huge fan of customized pet items. Every Christmas my tree is packed with ornaments featuring the names and pictures of my cats through the years. Since losing Truffles just two short years after Tara, I've been on the lookout for special ways to honor my two precious little girls, who will forever be linked to each other in my heart. When the opportunity to review a custom tote bag from Tote Tails arrived, I knew that I had found what I'd been looking for. I uploaded pictures of Tara and Truffles (premade silhouettes of popular dog and cat breeds are also available), and within just a couple days I received a mock up in my email with the options to make any changes that I would like. The placement of paw prints and wording is completely up to you too. When my tote bag arrived in the mail I just starting crying. The silhouettes are the purr-fect likeness of my angels. It's something I will treasure forever and it makes me so proud to have already had people ask me about it when I've used it to run errands. These custom totes are a truly unique & wonderful gift idea or way to treat yourself to something special. The price is outrageously low, the designs are classy and fun, and the tote itself is extremely well made and durable. And...10% of every product purchased on totetails.com goes directly to benefit the SPCA, Humane Society and other animal welfare organizations. Nothing makes me happier than supporting small businesses that help animals. ﻿* A unique hand-painted silhouette likeness of your pet. * High quality 12 oz. heavy canvas tote bag material. * 14" X 15" X 4" dimensions mean you can fit all of the goodies from your farmer's market trip into one bag. * 21" straps allow for a comfortable carry and easy access to contents inside the tote bag. * A carrying capacity that easily exceeds 25 lb's. If you don't end up being the lucky winner, please consider purchasing a tote of your beloved pet(s). Mudpie is already asking that I design one just for her! Full disclosure: I received a customized tote from Tote Tails in exchange for my fair and honest review. Receiving free product did not influence my opinion about it; all opinions expressed on this site are my own. I only feature products I have used or would use or that I feel are of interest to readers. What a nice idea! 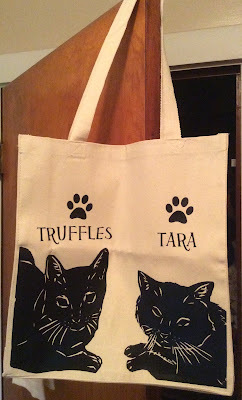 A human can never have too many tote bags, especially with photos of the fur children. Dat's pawsum and looks so cool. mommy dusn't have da decowations like you altho' she wishes she did. but she luvs da cat themed fings fur sure. Have a pawsum day. What a neat way to remember your furbabies! I would a picture of my fur children on it. What a lovely tote! Happy 2nd Gotcha Day to Angel Truffles. My design on the tote bag would have Angel Piper on it! 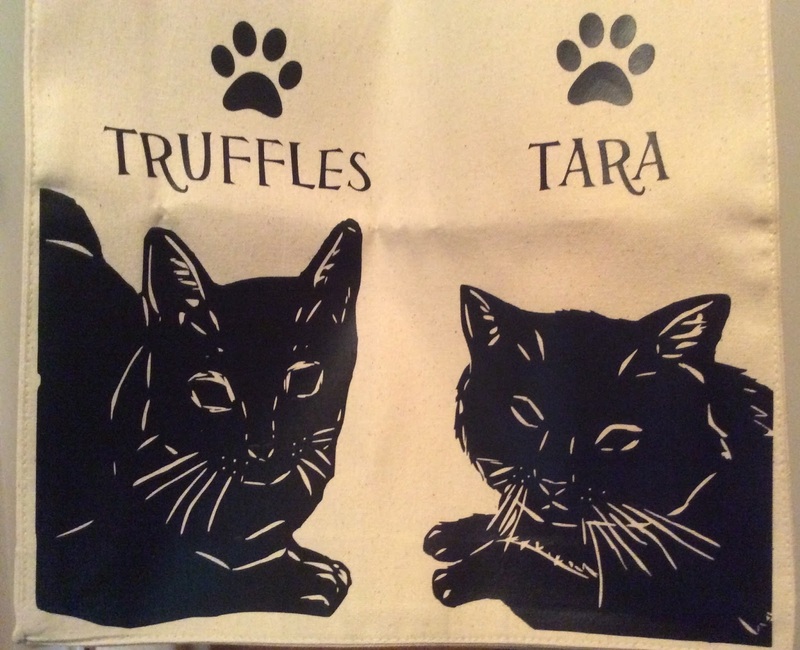 That is a pawsome bag and way to remember two lovely kitties! What a cool tote! Big hugs and purrs to you today. Anniversaries are hard. Those are such great totes. Love how they did the pictures of your two cats. Big hugs to you. I have seen these before and they are great! I would probably put a picture of Cody and Dakota on my bag, I love how you incorporated your two babies! These are so cute:) I would put my fur babies on it. I love the totes that you made. What a clever idea. Mine will be crowded with three marvelous cats. One one is a polydactyl, so the footprint will be lots of fun! Sweet! I'm sure Truffles (and Tara) are sending you purrs, today. We wish Truffles a very happy Gotcha at the Bridge. We sure do miss her. What a great giveaway and so sweet to do it on Truffles Gotcha. Love your bag. We just fawt we wuld let yous know awnty Melissa dat altho me didn't like da Composure tweats, they do have a liquid furm. But mommy bought me sum Bach RRescue Remedy fwum da amazon.com and puts a dwop on meez ear every meownin' and it seems to be workin' gweat. Yesfurday duwin' our stowrm me laid wound on da cat twee and played while da funner boomers wumbled. Not sumfin' me duz as you knwo. So it's workin', but she has to do it everyday. Good luck wiff Mudpie. What a cute tote bag in memory of Truffles and Tara! It's very sweet to offer a giveaway on Truffles Gotcha Day. She would be very happy knowing some kitty mom is going to get a bag with their kitty on it. Hugs to you! These customized tote bags are a great idea. It's a beautiful homage to Truffles and Tara! I hope that would be a local Humane Society chapter you can still (somewhat) trust, not the H.S.U.S. whose president's stated goal is "One more generation and they're out" (meaning domestic animals are extinct). Your bag came out great. I am sure today is a rough day for you. Everyone misses Truffles, she was a sweetie. So cute I would put pictures of my 3 kitties. Such a great idea for decorating totes. It would feature one or two of my nine fur babies. I'd have a picture of Bear put on the bag. She's a yorkie. (hope the kitties didn't hear that). Maybe I could take her with me more often. I would have a photo of my pug baby. I would add Artie and Kouga to the tote. This is such a unique gift, thank you for hosting the giveaway. Lovely, Melissa. What a wonderful way to honor Truffles. Love it! I would put my cat Shadow's face and name on that bag. I have two GSD's i'd love to have on a tote! what a cute product! Well this would have to be images of my 2 pups.